Are you struggling with skin that is sensitive and easily irritated? Maybe your problem centers on blemishes and acne, or perhaps you deal with the frustrating embarrassment and discomfort that is Rosacea. At PuraVeda Organics, we have done intense research on the condition of rosacea and created a unique and effective skincare regimen. 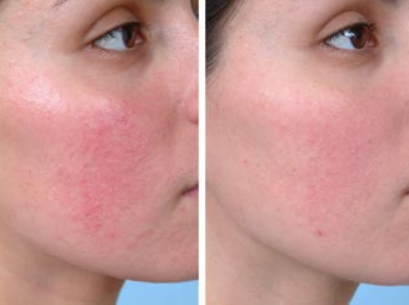 Interested in more in-depth information on rosacea? Check out this BLOG ARTICLE to learn more. You may be surprised to learn that according to Ayurvedic medicine tradition: ALL of these conditions stem from the same source, which is an overabundance of "Pitta." In Hindu, Pitta, literally means your skin is, "on fire from within." PuraVeda SBR (senstive/blemished/rosacea) Ayurvedic formulas are not only highly effective for Pitta skin types-- they are also highly effective anti-aging therapy. Designed to work in a synergistic manner, this calming & soothing product line is a blend of [plant sourced natural] vitamin's A & E, infused natural organic oils and concentrated botanicals to cool, sooth and heal sensitive and rosacea/blemish prone skin types--restoring balance to damaged tissues by accelerating cell rejuvenation, while strengthening the collagen net for healthier, less easily irritated skin.